SHIMA, Japan â€“ Shin Ji-yai won the Mizuno Classic for her second LPGA Tour title and ninth international victory of the year, shooting a 5-under 67 on Sunday to easily hold off Mayu Hattori at Kinetsu Kashikojima. The Women’s British Open winner and the first player to sweep the Korea LPGA Tour’s three majors in a season, Shin finished at 15-under 201 for her second victory of the year in Japan. The 20-year-old South Korean star earned $210,000. Hattori, the Japanese player coming off a victory last week in the Japan LPGA’s IDC Otsuka Ladies, closed with a 67 to finish second, six strokes back in the event sanctioned by the LPGA Tour and JLPGA. Lim Eun-a (70) was third at 8 under, and Chung Il-mi (69), Wei Yun-jye (70) and Lee Jee-young (72) followed at 7 under. Shin played the front nine in 4 under â€” birdieing Nos. 2 and 3 and holing an eagle chip on the par-5 seventh â€” to move four strokes ahead of Hattori and Lee. Lee birdied the 10th to cut Shin’s lead to three, but had a double bogey on the par-3 11th. Shin birdied the par-5 13th and had a six-stroke lead with four to play. She three-putted for a bogey on the par-4 15th, only her second bogey on the week and first in 47 holes, then birdied the par-5 16th and closed with two pars. Shin now has two LPGA wins and she isn’t yet a LPGA Rookie. She will be eligible for Rookie of Year, assuming Ji-Yai comes to play in the US. She has been tearing up the KLPGA, to a lesser extent the JLPGA for a few years now. 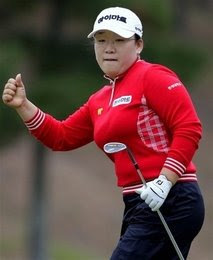 You read it here first, the second South Korean LPGA golfer to qualify for the Golf Hall of Fame will be Ji-Yai Shin. Take that to the bank. The complaints the Koreans are taking over the LPGA are about to get louder. Isn’t it about the best golfer is, not where in the world they are from? Note- Shin is rated #8 in the world right now. Update- Hound Dog, perhaps the best blogger who out there writing about the LPGA, agrees with my assessment of Shin. The reigning British Open champ blew everyone away the last two days in a manner reminiscent of Lorena Ochoa. That’s how good Ji-Yai Shin might be. It’s too bad this tournament doesn’t get any U.S. exposure or a lot more Americans would know what Asia already does – Ji-Yai Shin is a contender to overtake Ochoa as World #1 as soon as 2009.